The ad agency for Israel’s national carrier, El Al Airlines, is making hay from a recent incident in which a Jewish teen was taken off a U.S. domestic flight after he began to don religious tefillin, or phylacteries. (IsraelNN.com) “Fly with us! 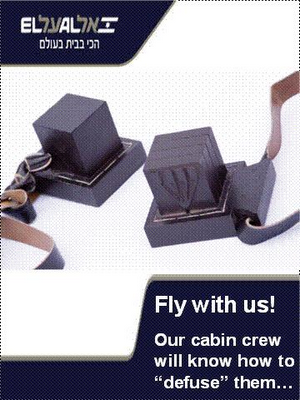 Our cabin crew will know how to “defuse” them…” the advertisement for El Al Airlines jocularly proclaims in English, with a full-color photo of the tefillin against a mild blue sky. The tefillin, a set of small leather boxes that are black in color and contain scrolls of parchment inscribed with Old Testment verses, worn by Jewish men during weekday morning prayers, apparently ignited suspicions among the cabin crew and passengers on the small domestic U.S. Airways flight that the boy was a would-be suicide bomber. The plane changed its flight plan and immediately diverted to Philadelphia, where police escorted the 17-year-old “suspect” off the aircraft, which parked in a remote section of the tarmac at Philadelphia International Airport. It is not really clear whether the “ad” is, in fact, a legitimate ad; AgencySpy editor Matt Van Hoven writes on the Media Bistro creative website that even he has been unable to track down the whereabouts of the elusive “real” advertising agency for El Al Airlines. How an Orthodox Jew should pray on a plane without terrorizing the other passengers.